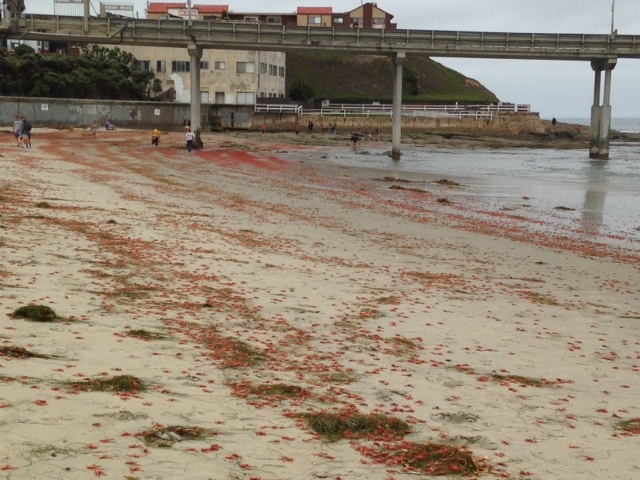 The red crabs reached OB yesterday, June 11th. There’s plenty of them – pelagic red crabs (Pleuroncodes planipes) – that washed up along the high tide line between Ocean Beach and Blacks. They are usually associated with warmer water temperatures, and perhaps came during the unseasonably warm spring temperatures a few weeks back. They are clearly not happy in the normal temperatures now, almost all the ones we saw yesterday were obviously on the edge of dying, at the surface, swimming very slowly, sitting ducks for predators, as makes sense given that they are now washing up on the beach. Does anyone know if this is a rare occurrence? We’ve been experiencing some odd surface temperature fluctuations over the past couple days (54-64F in the last 24 hours). They actually arrived about a week ago. When I took my dogs to Dog Beach on Saturday, one of my dogs pigged out on the carcasses all along the water. I wondered if they would have any effect on him but they didn’t, hounds have cast iron stomachs. I’ve seen this a few times over the years but it has been a while. Newer Article: Has the Santa Barbara Oil Spill Finally Reached San Diego? Tar Bars at La Jolla.